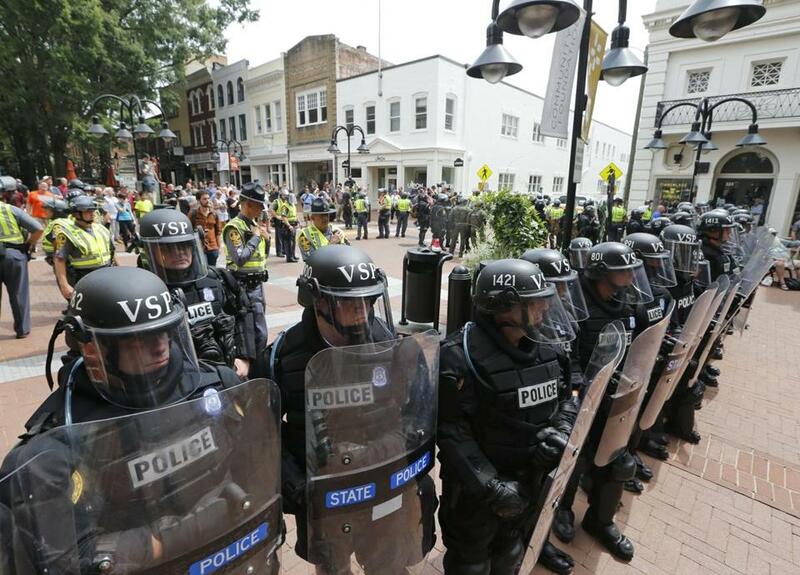 CHARLOTTESVILLE, Va. — The city of Charlottesville was engulfed by violence Saturday as white nationalists and counterprotesters clashed in one of the bloodiest fights to date over the removal of Confederate monuments across the South. White nationalists had long planned a demonstration over the city’s decision to remove a statue of Robert E. Lee. But the rally quickly exploded into racial taunting, shoving, and outright brawling, prompting the governor to declare a state of emergency and the National Guard to join police in clearing the area. Those skirmishes mostly resulted in cuts and bruises. But after the rally at a city park was dispersed, a car bearing Ohio license plates plowed into a crowd near the city’s downtown mall killing a 32-year-old woman. Some 34 others were injured; at least 19 in the crash, according to a spokeswoman for the University of Virginia Medical Center. Colonel Martin Kumer, the superintendent of the Albemarle-Charlottesville Regional Jail, confirmed Saturday evening that an Ohio man, James Alex Fields Jr., 20, of Maumee, had been arrested and charged with second-degree murder, three counts of malicious wounding, and failing to stop at the scene of a crash that resulted in a death. The authorities declined to say publicly that Fields was the driver of the car that plowed into the crowd. Witnesses to the crash said a gray sports car accelerated into a crowd of counterdemonstrators, who were marching jubilantly near the mall after the white nationalists had left, and hurled at least two people into the air. The planned rally was promoted as “Unite the Right,” and both its organizers and critics said they expected it to be one of the largest gathering of white nationalists in recent times, attracting groups like the Ku Klux Klan and neo-Nazis, and movement leaders like David Duke and Richard Spencer. The president came under criticism from some who said that he had not responded strongly enough against racism and that he had failed to condemn by name the white nationalist groups that were behind the rally. Among those displeased with Trump was the mayor of Charlottesville, Mike Signer. “I do hope that he looks himself in the mirror and thinks very deeply about who he consorted with during his campaign,” he said. Late Saturday, the Department of Justice announced that it was opening a civil-rights investigation into “the circumstances of the deadly vehicular incident,” to be conducted by the FBI, the US attorney for the Western District of Virginia, and the department’s Civil Rights Division. Hundreds of counterprotesters — religious leaders, Black Lives Matter activists, and anti-fascist groups known as “antifa” — quickly surrounded the park, singing spirituals, chanting, and carrying their own signs. 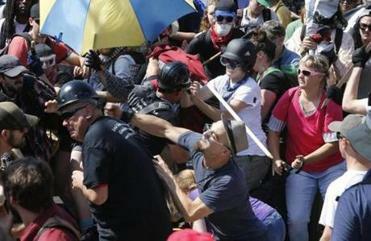 Barricades encircling the park and separating the two sides began to come down, and police temporarily retreated. People were seen clubbing one another in the streets, and pepper spray filled the air. One of the white nationalists left the park bleeding, his head wrapped in gauze. Declaring the gathering an unlawful assembly, police cleared the area before noon, and the Virginia National Guard arrived as officers began arresting some who remained. But fears lingered that the altercation would start again nearby, as demonstrators dispersed in smaller groups. Within an hour, politicians, including Governor Terry McAuliffe, a Democrat, and House Speaker Paul Ryan of Wisconsin, a Republican, had condemned the violence. Sessions said Justice Department agents would support local and state officials in an investigation of Saturday’s events. “This kind of violence is totally contrary to American values and can never be tolerated,” Sessions said in a statement. Both Kessler and Spencer, a prominent white nationalist who was to speak Saturday, are graduates of the University of Virginia. In an online video, titled “a message to Charlottesville,” Spencer vowed to return to the college town. 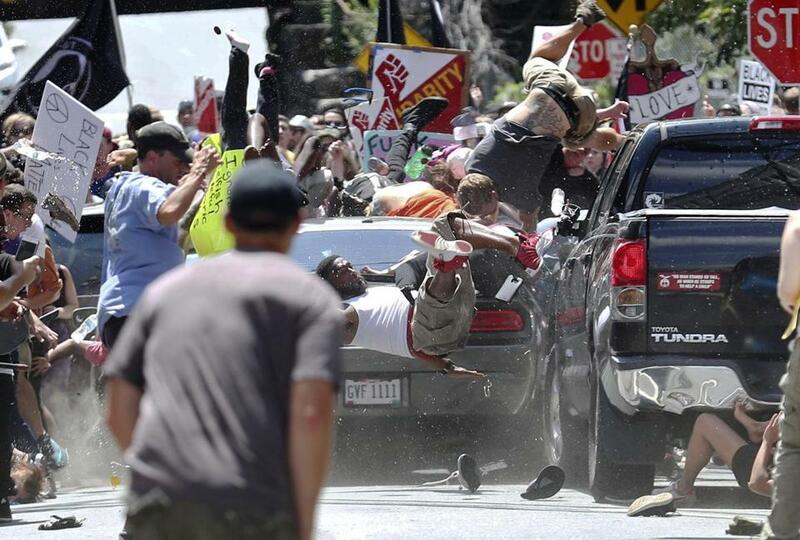 People flew into the air as a car drove into a group of protesters demonstrating against a white nationalist rally in Charlottesville on Saturday. The violence in Charlottesville was the latest development in a series of dramas unfolding across the United States over plans to remove statues and other historical markers of the Confederacy. The battles have been intensified by the election of Trump, who enjoys fervent support from white nationalists. In New Orleans, tempers flared this spring when four Confederate-era monuments were taken down. Hundreds of far-right and liberal protesters squared off, with occasional bouts of violence, under another statue of Lee. There were fisticuffs and a lot of shouting, but nothing like the violence seen in Charlottesville. In St. Louis, workers removed a Confederate monument from Forest Park in June, ending a drawn-out battle over its fate. In Frederick, Md., a bust of Roger Taney, the chief justice of the United States who wrote the notorious 1857 Dred Scott decision denying blacks citizenship, was removed in May from its spot near City Hall. Here in Charlottesville, Saturday’s protest was the culmination of a year and a half of debate over the Lee statue. A movement to withdraw it began when an African-American high school student here started a petition. The City Council voted 3-2 in April to sell it, but a judge issued an injunction temporarily stopping the move. The city had been bracing for a sea of demonstrators, and Friday night, hundreds of them, carrying lit torches, marched on the picturesque grounds of the University of Virginia, founded in 1819 by Thomas Jefferson. Many of the white nationalist protesters carried campaign signs for Trump. McAuliffe followed with his own declaration an hour later. 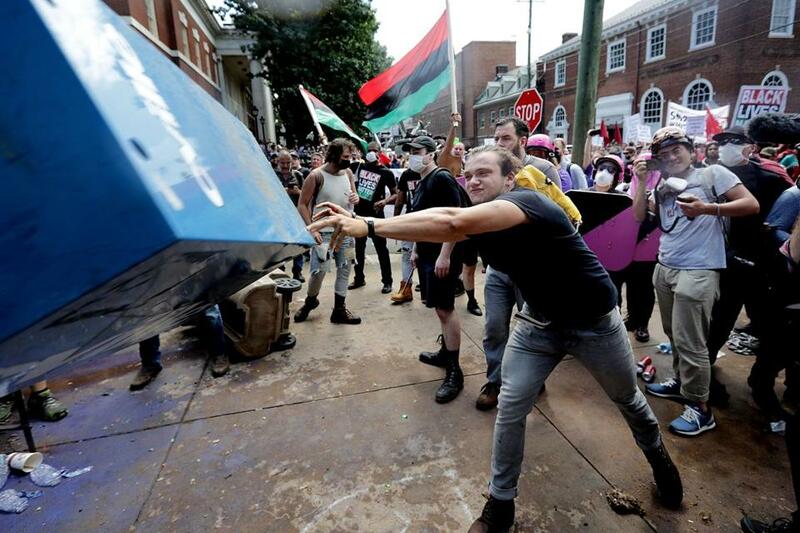 A counterprotester threw a newspaper box toward white nationalists in Charlottesville on Saturday. Virginia State Police cordoned off an area around the site where a car ran into a group of protesters after a white nationalist rally in Charlottesville. 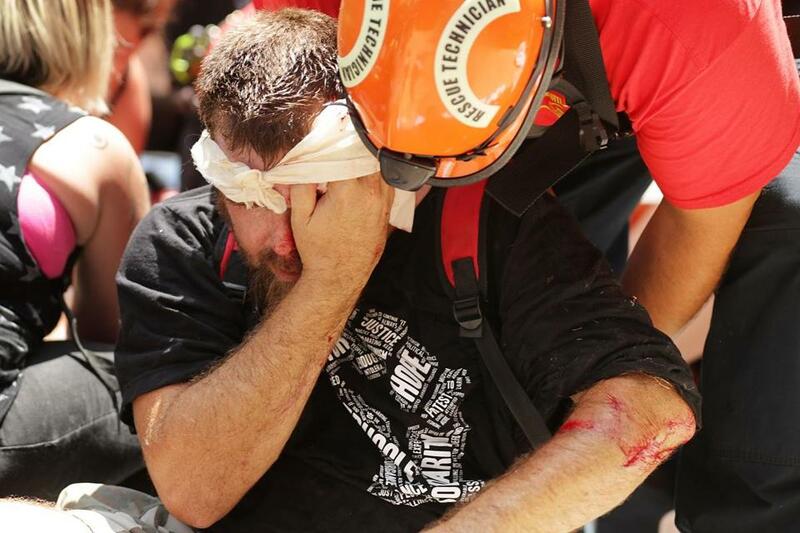 Rescue workers and medics tended to many people who were injured when a car plowed through the crowd on Saturday in Charlottesville.